As an artist, when we consider the ground, the fundamental starting point of our work, we can build up to something amazing. Also the ground itself can be integral to the work. Often we become tied to the image and forget the ground on which the image lies. So it is with paper. An understanding of paper, how it works and what it is made up of will give us a key to how the mediums we work into and onto the paper can create depth and breadth we had not considered. Paper is fiber. Classically paper fiber was from mulberry trees in the original development of them in China. Mulberry is a strong fiber and bonds to itself under pressure very easily. In the west, cotton, linen and hemp became some of the best fibers to pulp into paper. Pulping means pushing water into the fiber such that it is hydrostatically merged with the fibers. When the pulp is put under intense pressure, 20 tons or more, the water is pushed out of the fiber and the fibers bond to each other where the water molecules were originally attached electrostatically to the fiber. This means the fiber shares with each other in matrix crystallization. The more we pulp the fiber and mash it close together, the more potential points exists for the fibers to bond together. Depending on the fiber, this will create a more translucent paper and also stiffer. If we were to have 100% bonding, the fibers would be totally clear and crystalline. But paper normally has 8-12% bonding throughout. Where there is no bonding, the fiber is open to receive other chemicals, paints and the like for the artist. Since paper is created by removing water from its matrix, then reading water can potentially weaken the paper. Thus paper makers add to the pulp before the sheet is pressed chemical sizing. This sizing resists the reversal of the bond after the paper is completely dry. This is called internal sizing. There is also external sizing… or a surface preparation which is added after initial drying of the sheets. Classically made from gelatin, which came from the hooves of horses, this allows the artist to paint onto paper without the image soaking into the paper and being lost or blotting out. Modern paints have differing chemistry. 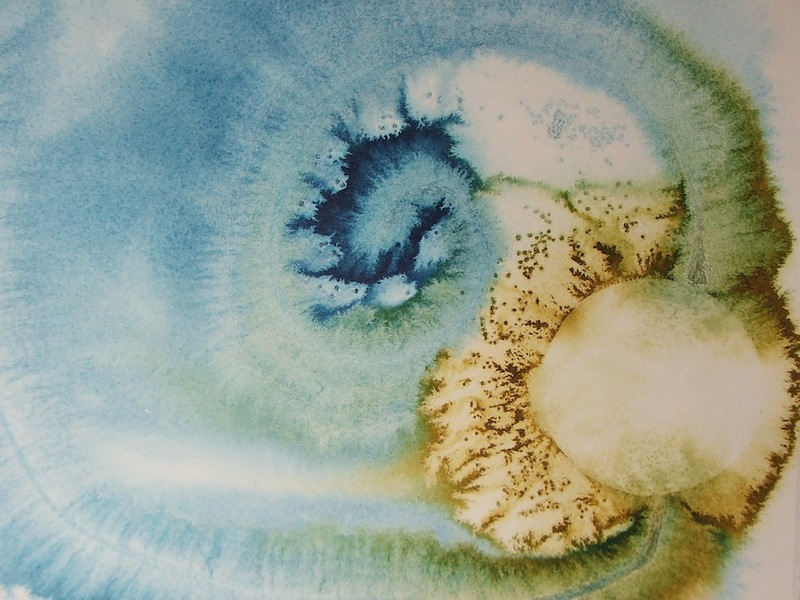 Watercolor pigments are suspended in water and gum Arabic. 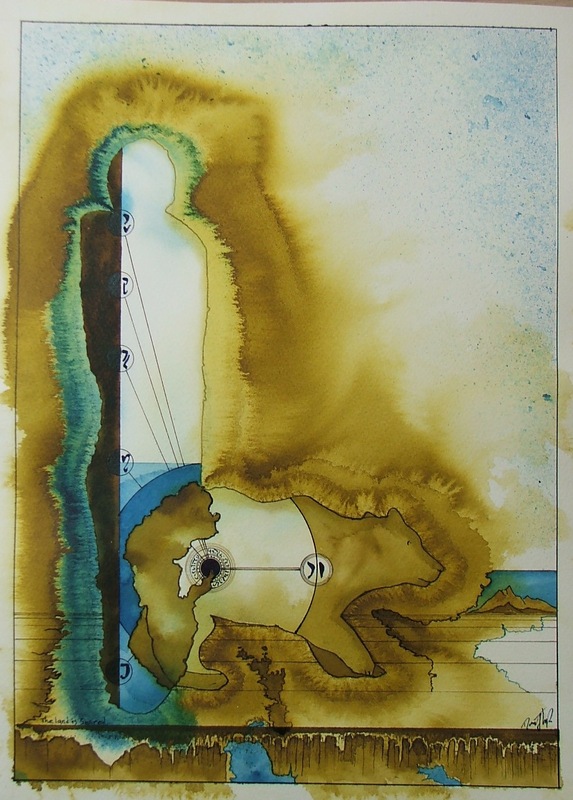 Watercolors are forever sensitive to later layers of water which can disturb the lower layers. India inks have shellac or classically iron gall to make them permanent when dry on the surface of the paper. Acrylic has polymers which when dry are permanent as well and bond to the fibers allowing layering to be built up over time. Some inks are made from acrylic and shellac which can create even better bonding. With both chemicals, the pigmented ink can be thinned down to create some amazing washes. Staining papers allows for the pigments to go deep within the paper and give a variety of affects which then can be drawn or painted over. Each type of paper and fiber can create differing affects. A paper with only internal sizing, like a print paper, Rives BFK or Pesche, have differing amounts of internal sizing based on the creation of the paper. 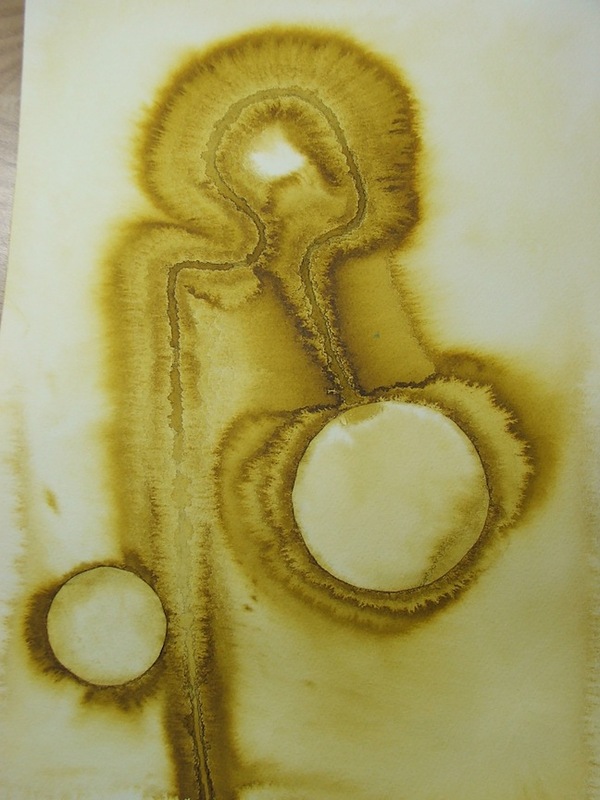 When stained the paper can have soft dramatic stains, dying or reticulation affects. 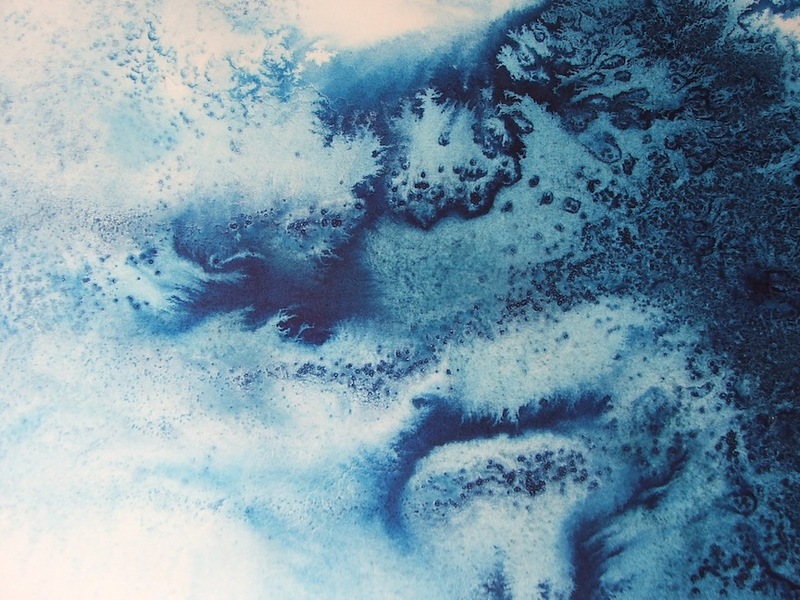 Watercolor paper, Fabriano Artistico or Arches, create more dramatic and darker affects in staining because the external sizing resists the pigments merging deep within the layers of the paper. Rives BFK Stain with String and circle pattern. Another thing to consider is the time which the paper is soaked in a bath of water or just sprayed. By soaking, the paper expands and can be very open to deep stains even if it has an external sizing on its surface. Some of this sizing will leave the paper when soaking occurs for a long time. This process is not an exact science which can create some interesting affects because the ink always dries at a lighter value then when it is initially added to the paper. 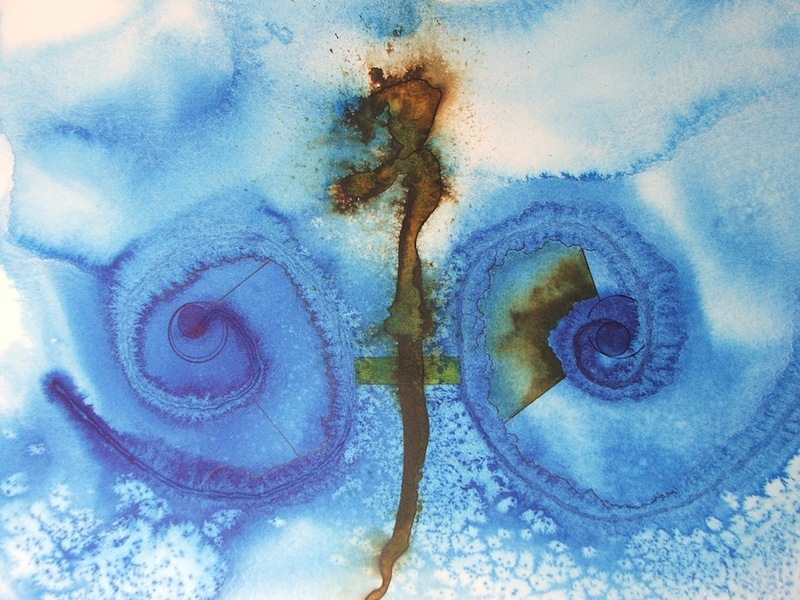 Also different pigments act differently when staining a significantly wet piece of paper. Blues diffuse more than browns and certain reds. 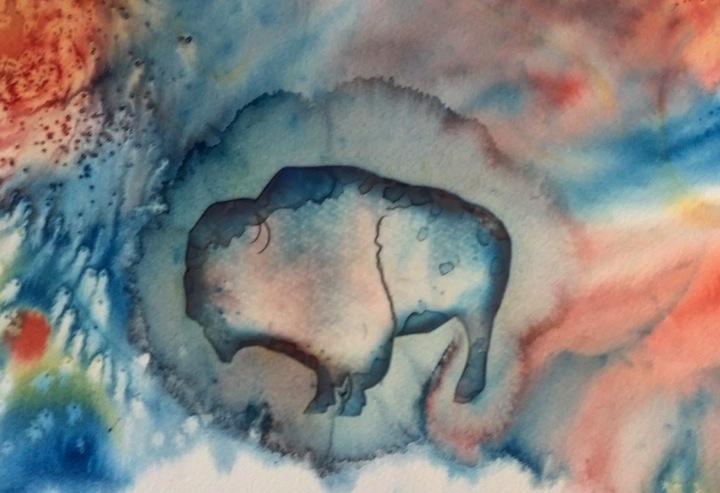 Classical pigments made from dirt quickly fall through the water and into the paper. Lighter pigments and chemically derived pigments difuse and run along the top of the water and merge more slowly. So there is a vast potential to the base layer and the fibers chosen for a stain of paper. My preference in many stains is Artistico. And I prefer FW Inks from Daler Rowney because of the combined effect of acrylic and shellac. Other acrylic inks or fluid acrylics are often too thick with acrylic to get subtle affects. And pure shellac inks tend to flow and lay down too evenly. As the paper dries, water, which has a liquid affect along its edge, will dry in interesting lines. If we could see this under a microscope, the water will suddenly let go of a line and pop back. This allows for articulation because the edge of the water drying line has more pigment in a wet preparation than what is behind it. I also add to my stains patterns, strings and other surface fibers like gauze, which holds the water longer and gives other affects while drying. As the paper further away from the line of drying starts to migrate back towards the wetter areas, the strings, patterns and surfaces continue to hydrate areas, which gives the paper affects as it dries. Salt, sugar and other additives have to be placed on the paper when it is not totally soaked, or the salt just merges with the water. But also not too dry or the salt does not pull pigment to itself. Once the paper is completely dry, one can stain it again, though the initial layer begins to seal the paper from deep stains. Some papers will need to be flattened or stretched in a classical watercolor preparation method so the paper is flat. Artistico is one of the papers, which dries relatively flat so that the next layer of painting easy goes on without flattening. I also prefer this paper because I can work a number of sheets for building up to the book form. Again, when we consider the fiber, the paper and the chemistry of paper, artists can begin to think deeper into the initial matrix of our creation. As a side note, stained papers in this manner can be easily added to canvas, boards and other painting techniques for rich complements for layering. Also mediums, textures and other elements can be added on top. Even gesso can be used to block out areas for a more classical acrylic technique. Oil paint should be in general avoided with paper that is still open. Oil breaks down paper fibers… though as we add more acrylic layers on top of the paper, oil can be painted where acrylic medium, paint and the like have sealed the fibers away from the oil which sits on top of that layer. Pattern stain with plastic cut out of a buffalo. Experiment and have fun… that is the key. The Land Is Sacred, completed painting with staining.